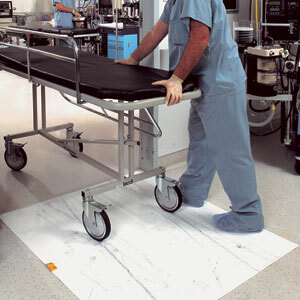 The disposable anti contamination mats (also known as “tack mats”) feature an anti-microbial agent to inhibit the growth of bacteria, mould and mildew. The adhesive coated surface captures dirt and dust particles from pedestrians and wheeled indoor traffic. Adhesive back pads stick the mat directly to the floor. Once the mat becomes contaminated simply peel off the top layer to reveal a brand new layer underneath. This economic solution to contamination control makes this mat ideal for use in food preparation areas, hospitals, paint shops and clean rooms. Available in White, Blue or Grey, in packs of 4 pads each with 30 layers.